Kadoma General Hospital is one of the institutions built in the pre-independence era, delivering health care services to patients in Kadoma urban, Mhondoro and Sanyati rural districts. Zimplats is working on a project to rehabilitate Kadoma General Hospital in a bid to improve healthcare delivery at one of the major referral hospitals in the country and the second largest hospital in the Mashonaland West Province. However, over the years this major referral hospital has struggled to carry out basic maintenance and this has largely compromised the hospital’s ability to provide quality healthcare. Kadoma General Hospital has a staff complement of 372 and all the heath service providers at the institution are keen to recover their ability to ensure that the communities they serve receive quality healthcare. The refurbishment exercise at the hospital is doing a lot to improve staff morale. With a bed capacity of 150 and an average rate of 300 patients a day, this institution is leading the pack in reforming health services in the province. 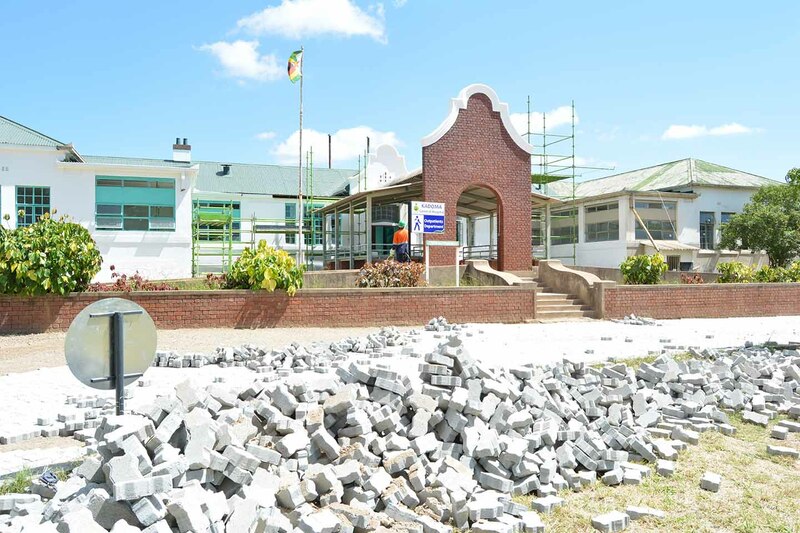 Zimplats is currently rehabilitating Kadoma General Hospital, with no major maintenance works having been done in the past 15 years due to economic challenges. The disease burden has not only increased but it has changed over the years due to the upsurge in non-communicable disease, HIV/ AIDS along with opportunistic infections. This upsurge creates a need to introduce new departments and expand services issued by the hospital which is what the refurbishment will ensure. The rehabilitation project therefore fits in with the increasing demands and opportunities for expansion at the hospital. Water supply was a major issue at the hospital with the hospital having experienced more than a decade of erratic water supplies. Amongst various other improvements which are still in the pipeline at the hospital, Zimplats has managed to restore supply of water to the institution. Two boreholes with capacity to meet the hospital’s portable water needs have been drilled and equipped. Repairs to ablutions and sewer facilities are 60% complete with some public ablutions that had been non-functional since 2005 now commissioned for use. Zimplats recognizes the need to empower local businesses and the company is working with a total of seven local enterprises on the four month project which has attracted an average labour force of 150 with 66% having been drawn from the surrounding community. The local enterprises are a part of Zimplats Local Enterprise Development Programme (LEDs). In 2013, Zimplats embarked on a local enterprise development (LEDs) program to develop indigenous suppliers who are geographically located around Zimplats’ mining and processing operations. Through this structured LEDs programme, Zimplats assists the targeted enterprises financially and technically to set up their operations and then it purchases their goods and services at competitive rates for its business operations. LEDs working on the Kadoma Hospital project are therefore responsible for project management, structural renovations, roadworks and plumbing, equipment supplies, steel fabrications, quality assurance of civil works and building materials supply. The enterprises working on the project are Grindale Engineering, SADO contractors, Telstone Trading, AGES Engineering Services, AGL, Dostaro and Turf Brick Moulding Company. Three of these are female led enterprises.